Noise: Randomizes the colors of selected pixels in the drop or inner shadows to give a gritty effect. Anti-Aliasing: Slightly softens the edge pixels of a contour. Range: Controls how much of the glow is targeted for the contour. Reduce the Range setting to get a less feathered, tighter, and larger glow. Jitter: Doesn’t affect the appearance of the default glow, but with other gradients, the Jitter setting varies the color and opacity of selected pixels to give a roughened effect. Invert: Turns the colors of the satin effect inside out. Gloss Contour: Changes the distribution of color in the effect over the layer. It creates a metallic effect when used with the Bevel and Emboss styles. The Contour option that appears indented below the Bevel and Emboss style in the Styles list does the same for the edges of the layer. It creates shaded and highlighted nooks and crannies when used with the Bevel and Emboss styles. Open the Contour Editor dialog box by clicking the Contour thumbnail in the Layer Style dialog box. Click the line on the Mapping grid to add points and drag the line to adjust the slope. You can also select a point on the Mapping line and enter values in the Input and Output boxes. To create a sharp corner, rather than a curve, select a point and click the Corner option. When you have the contour to your liking, click the New button, give it a name in the Contour Name dialog box that appears and click OK.
Photoshop saves your custom contour as a preset and makes it available in the Contour panel. You can save custom contours for reloading later or for trading with friends and neighbors. (Try giving them away on Halloween.) 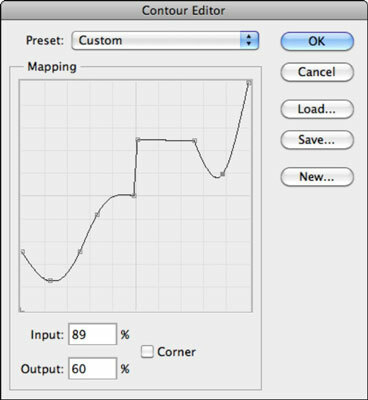 Photoshop saves a contour as a shc file in the Contours folder in the Presets folder in the Photoshop application folder.